I don’t spend a lot of time thinking about side dishes. (Honestly, if there’s no chocolate or butter in it I rarely spend any time thinking about it.) But I saw a version of this on Pinterest and my mouth immediately started watering. I figured if I was salivating over vegetables, there was a chance the kids might go for it too. I was right. They loved these “cheesy vegetables” a bunch. 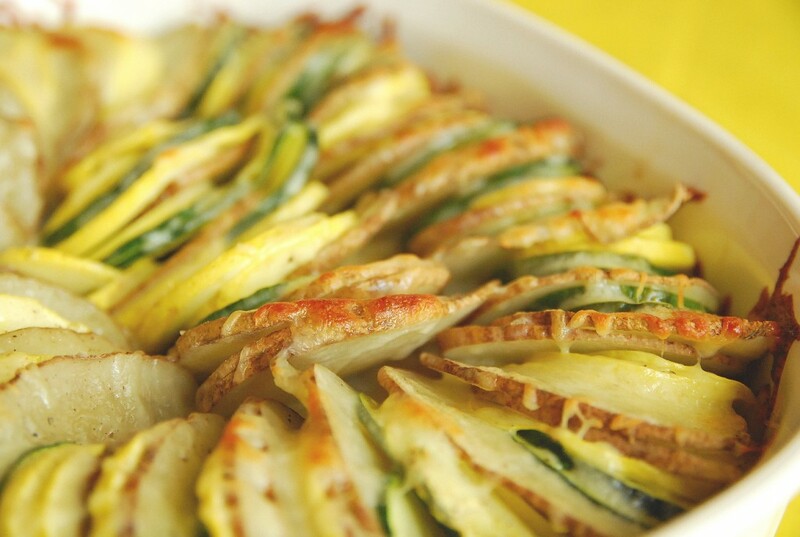 A tian is a fancy French term for thinly sliced veggies topped with cheese and then roasted in the oven. Super simple. 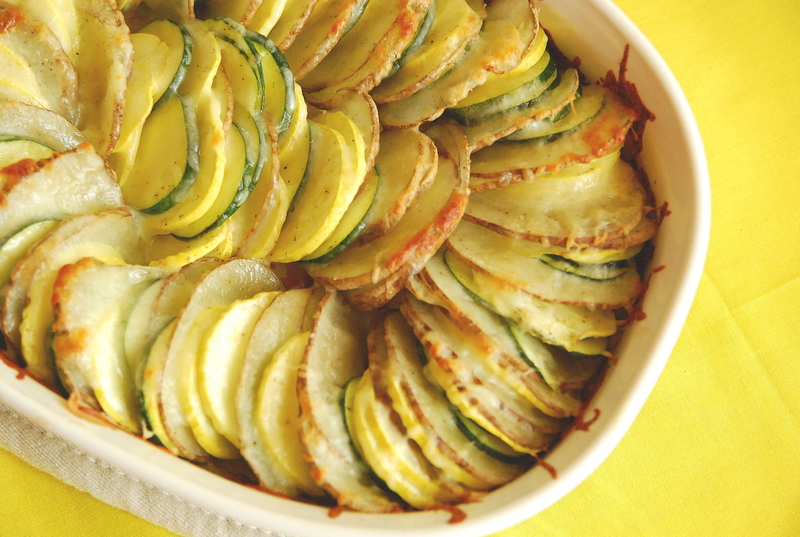 This dish comes together so quickly if you have a mandoline. With it, you can have all the veggies sliced in less than five minutes. Preheat the oven to 400. Finely dice the onion and mince the garlic. Sauté both in a skillet with olive oil until softened (about five minutes). While the onion and garlic are sautéing, thinly slice the rest of the vegetables. A mandoline really helps speed this up. Spray the inside of an 8x8 square or round baking dish with non-stick spray. Spread the softened onion and garlic in the bottom of the dish. Place the thinly sliced vegetables in the baking dish vertically, in an alternating pattern. Sprinkle generously with salt, pepper, and thyme. Cover the dish with foil and bake for 30 minutes. Remove the foil, top with cheese and bake for another 15 minutes or until the cheese is golden brown.